One of the largest student organizations on the campus of Belleville East High School is the Belleville East Marching Lancers. The Marching Lancers march parades throughout the year, starting at the beginning of the summer and finishing in late November. At the beginning of August, the band goes through two weeks of band camp, when they learn their marching show for the fall season. 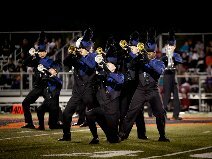 They perform the show during halftime at home football games and at major competitions in the Metro East area. Every two years, the band attends a bowl game. In 2002, the Marching Lancers went to the Peach Bowl in Atlanta, Georgia where they won top honors including Grand Champion. In 2004, they marched at the Liberty Bowl in Memphis, Tennessee, also winning the Grand Champion trophy. In 2006 the Marching Lancers performed in the Outback Bowl in Tampa, FL where they were grand champions of Jazz and Concert Band and placed 2nd in the parade and 3rd in the field show. The next trip is in the works.